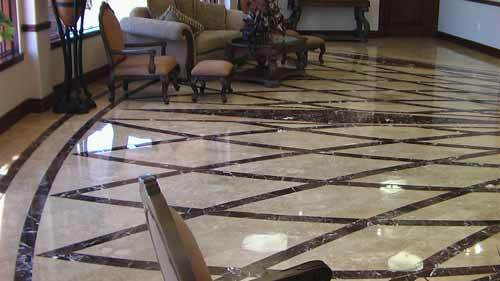 Floor Decor - In Stone - Custom Beauty Unmatched! Beautiful Stone Medallions . . . Floor Decor . . . Natural Stone and Tile or granite medallions for Business Logos, Family Crests, or just Elegant Designs! In stone . . . Beautiful Custom Stone Creations. Do you need that "Touch of Class" a custom stone medallion conveys. Are you looking for a Corporate Business Logo that expresses quality and character? What is the calibre of your business? Express it in Solid Stone. Perhaps you would like a Custom Family Crest! By the way, it doesn't need to be only for the floor. These stone works of art are more and more being installed on walls. In fact, custom Stone Medallions and Inlays are achievable in floors, on walls, on ceilings, in countertops, on hearths and fireplaces, on backsplashes, and around and in the pool. Architectural Engineering Specification or Artistic Vision! Turn that project into a reality. It all starts with a thought. To think is to create. Give us a call for some ideas, or if you just have a sketch, shoot us a copy, and together, let's see where we can take it. Worried about installation? Not a problem, our sister company, Vanguard Construction installed the floor pictured above, and will be glad to quote installations. Visit our Home Decorators Collection. It is an Idea Bank for great interior design ideas as well as yard and garden decor. Or click on the following link for some other great options!